Enthusiasts of genuine tragedy and celebrity intrique, gird your mental loins for an authentic tale of unbelievable hardship and epic catastrophe! This wholly true and accurate account details the extraordinary lives of Evelyn and Evelyn, a darling but unfortunate pair of conjoined twins who brave extreme circumstances of calamity and adversity, such as the bizarre and bloody night of their birth and subsequent orphaning; their early years on a chicken farm; shocking encounters with depraved gentlemen; life in the circus; the terrible fates of their dearest friends; and concluding with the sisters' rise to international fame via the internet! Evelyn Evelyn is unlike anything I've ever experienced before. Although it’s labeled a graphic novel, it really reads more like a dark picture book. There is one large panel on every two page spread, and the story is told more in pictures than in words. As I said, it's unlike anything I've experienced. There is a gruesome charm to this book, and it drew me in to its pages without even trying. The illustrations border on disturbing, and are definitely macabre. Fans of this will adore Cynthia Von Buhler's work. There isn't a single page that has a happy vibe about it. Then again, Evelyn and Evelyn don't exactly have the happiest story, so it's very fitting. As time passes in the book, there are illustrated pages that mark what year it currently is. These were my favorite! I loved the shout outs to the things that happened in each of these years. 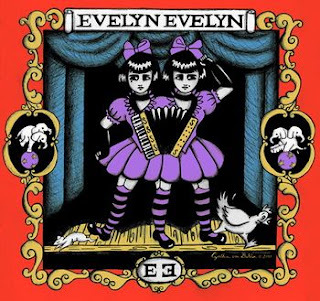 This book focuses on the life of Evelyn and Evelyn, two Siamese twin sisters who share three legs, two arms, two hearts, three lungs and a single liver. No, it's not a children's book and it's not your average story either. The two sisters find a lot of pain and suffering in their life time, starting with the death of their mother during child birth. Unforeseen circumstances keep causing them to have unhappy experiences. Poor girls. The writing style is clipped and to the point, with only one or two sentences on each page. It makes the story even more dark and mysterious. Overall this was an intriguing read that drew me in with it's dark charms. My one gripe was that there simply wasn't enough! By the time I finished, all I wanted was more. Evelyn Evelyn isn't going to be for everyone. It's dark tones will likely turn a lot of people off. However if you enjoy tales of woe and misadventure, this is for you. I know I loved it.